Summary and Definition: The Mohican tribe, aka the Mohegan, inhabited the northern end of the Hudson valley, in present-day New York, southern Vermont, western Massachusetts and the northwest of Connecticut. Once a strong powerful nation, they became embroiled in the French and Indian Wars (1688-1763). By 1782 only 138 Mohicans remained. What language did the Mohican tribe speak? The Mohican tribe spoke in a related dialect of the Algonquian language family. The meaning of the name 'Mohican' is derived from the Algonquin word "Muhhekunneuw" meaning "people of the waters that are never still". The Mohican (Mohegan) tribe were originally part of the Pequot people from the upper Hudson River Valley in New York near Lake Champlain. During the early 1500's the people moved to the Thames River Valley in southeastern Connecticut and split into two tribes, the Mohican and the Pequot. The Mohican (Mohegan) tribe established their territory in the inland forest areas of the upper and western portions of the Thames Valley, whereas the Pequot settled closer to the Connecticut coast. What was the lifestyle and culture of the Mohican tribe? The Mohican tribe were hunters and farmers who raised crops of beans, corn and squash. They were a powerful, highly organized tribe who lived in heavily fortified villages of longhouses or in temporary shelters of wigwams (wetu) during the summer hunting season. Like the Pequot, the Mohican tribe had a strong political structure. Their leader was a grand sachem who was supported by a tribal council. In 1633 the Mohican became allies of the English, an alliance that lasted for nearly a century. They were the bitter enemies of the tribes of the Iroquois Confederacy, especially the Mohawk tribe who frequently attacked their villages. The Mohican tribe supported the British throughout the French and Indian Wars (1688-1763). Disease and warfare reduced the number of Mohicans to just 138 by the the 1782 census and they joined the Oneida tribe. The destruction of the Mohican tribe was reflected in the fictitious story of the Last of the Mohicans written by James Fenimore Cooper. The Last of the Mohicans was written by James Fenimore Cooper in 1826 and is one of the most famous stories in American literature. The story is fictional but no doubt inspired by the fate of so many Native American Indian tribes who faced annihilation due to the encroachment of the early colonists and the devastating diseases that they brought from Europe. The above picture depicts Etow-Oh-Koam, also known as Nicholas, who was a Chief of the Mohican (Mohegan) of the Turtle Clan. It was painted by the artist Jan Verelst (1796-1872) in London, England in 1710. Etow-Oh-Koam was our Native American leaders who visited Queen Anne seal a treaty with the British. The diplomatic visit was organised by Pieter Schuyler, mayor of Albany, New York. Queen Anne commissioned the portrait of the four "Indian kings". The Chief Etow Oh Koam wore a red cloak draped over his shoulder over a white tunic - these clothes were special and unlike the simple clothing worn by his tribe. His belt was traditional possibly woven from dogbane or other plant fibers and colored with vegetable dyes. An English saber is attached to his waist and he holds a ball-headed wooden club, a favored weapon of the Mohican tribe, demonstrating his connection to the two nations. If you look at the picture you will see a turtle behind the chief's feet, as a symbol of the Turtle Clan of the Mohican. Where did the Mohican tribe live? The Mohican (Mohegan) are people of the Northeast Woodland Native American cultural group. The geography of the region in which they lived dictated the lifestyle and culture of the Mohican tribe. What did the Mohican tribe live in? The Mohican tribe lived in fortified villages of longhouses in the winter. In the summer when they travelled away on hunting expeditions they built a temporary pyramid or dome shaped shelters called wigwams. The Mohican wigwam was built with wooden frames that were covered with woven mats, sheets of birchbark and animal skins. Ropes were wrapped around the wigwam to hold the birch bark in place. What clothes did the Mohican wear? 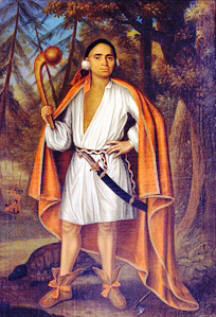 The simple clothes worn by the early Mohican tribe were made from animal skins or birchbark. These included long breechclouts, leggings, long cloaks and shoulder to waist length mantles. These were made from the skins of deer (buckskin) raccoon, beaver, otter and moose. Mohican Women wore wraparound skirts, tunics and cloaks. Moccasins were made of one piece of animal skin with a long tongue and a high collar that could be left up or folded down. The moccasins were greased on the outside for additional waterproofing. The Europeans introduced trade cloth to the Mohican tribe who adopted a more European type of dress. What food did the Mohican tribe eat? The food that the Mohican tribe ate included the 'three sisters' staple crops of corn, beans and squash. Fish such as sturgeon, pike and a variety of shellfish such as oysters, clams, lobsters and scallops were an important part of their food supply. Hunters provided meat from deer (venison), moose, black bear and smaller game like squirrel, rabbit, duck and wild turkey. The Mohican food also included nuts, vegetables, mushrooms and fruits (blueberries, strawberries and raspberries). The Mohican people used food preservation methods of drying and smoking to ensure that foods was available through the winter months. Mohican History: What happened to the Mohican tribe? The following Mohican history timeline details facts, dates and famous landmarks of the people. The Mohican timeline explains what happened to the people of their tribe. 1826: Author James Fenimore Cooper publishes his book "The Last of the Mohicans"